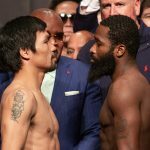 LAS VEGAS — Adrien Broner acknowledged Wednesday that he respect Manny Pacquiao. 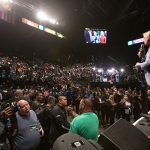 So it was no surprise that Friday’s weigh-in at MGM Grand Garden Arena was drama free, even if Broner is known for his antics. 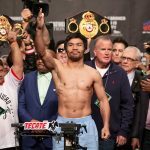 Pacquiao weighed in at 146 pounds, and as usual, he was shredded. It’s Pacquiao’s 11th consecutive fight at the welterweight limit. “Age is just a number. 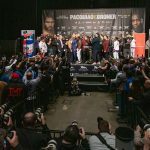 It doesn’t matter that I’m 40 years old,” Pacquiao, boxing’s only ever eight-division champion, said after stepping off the scale. “I still feel young. Tomorrow I have something to prove – that at the age of 40, I can still give my best. 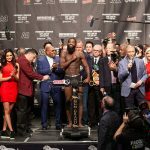 Broner tipped the scales at 146.5 pounds. He’s not always in the best shape, but this time, he looked more than ready for the task. 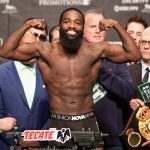 Broner, 29, has bounced around between 140 and 147 pounds and catch-weights in between. This is just his second consecutive fight at 147. The weigh-in for the PPV co-feature wasn’t so eventful. 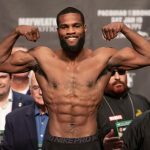 Badou Jack and Marcus Browne exchanged heated words after they both came in at the light heavyweight limit of 175 pounds for their 12-round fight. Both men had to be separated after the exchange. Indeed, Browne has never competed against a current or former champion. The 2012 Olympian has never even faced a fighter rated in The Ring’s top 10. Rau’see Warren and Nordine Oubaali fought each other in the 2012 Olympics, but now, they’ll meet as pros with the WBC bantamweight title on the line. It was Ouubali who prevailed in the unpaid ranks. 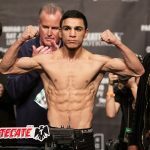 Warren weighed 116.5 pounds; Oubaali was 118. The only fighter scheduled for the PPV card who didn’t make weight was Jhack Tepora, who’s promoted by Pacquiao. 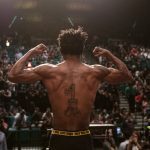 He was scheduled to fight Hugo Ruiz in a 12-round bout in the PPV opener. In his place steps in Alberto Guevara, who weighed in at the featherweight limit of 126 pounds. 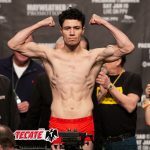 Ruiz weighed 125 pounds. 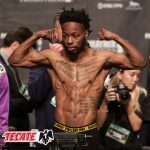 The post Manny Pacquiao, Adrien Broner ripped and ready for welterweight showdown appeared first on The Ring.